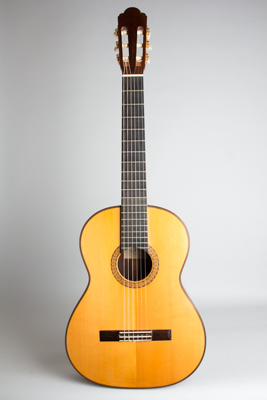 Manuel Velazquez Classical Guitar (1981), made in New York City, natural finish, Brazilian rosewood back and sides, sitka spruce top, original black hard shell case. Overall length is 39 3/8 in. (100 cm. ), 14 1/2 in. (36.8 cm.) wide at lower bout, and 4 1/16 in. (10.3 cm.) in depth at side, taken at the end block. Scale length is 25 1/2 in. (648 mm.). Width of nut is 2 1/8 in. (54 mm.). Very fine condition overall; very little play or handling wear at all. There is one splice to the top center seam, and the top appears to have a light French polish in some areas. The lamination seam on the heel also has a re-seal visible on close examination. This is an extremely neatly made and wonderful sounding guitar with exceptionaly clarity and balance, as we expect from this most well-respected of New York makers. Hand-signed and dated 1981 by the maker. Excellent - Condition.